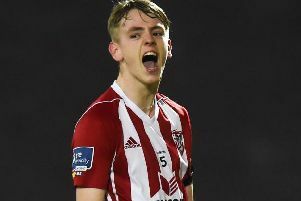 A top class performance from Derry City U17s inflicted a first defeat of the season on a talented Bohemians/.SKB side at the Ryan McBride Brandywell Stadium on Saturday. The visitors went in front early in the second half from the penalty spot but two goals in the final 10 minutes from former Foyle Harps stars Orrin McLaughlin and Liam Quigley sealed an impressive win for Donal O’Brien and Mo Mahon’s side. This was only Derry’s second ever win over Bohs at this level, so a credit to the local teenagers. Derry City U17: Kyle Burns, Caoimhin Porter, Eoin McLaughlin, Ryan Kennedy, Shaun McDermott, Michael Harris, Ronan McAleer, Evan McLaughlin, Liam Quigley, Orrin McLaughlin, Patrick Ferry. Meanwhile Derry City under-13's rescued a 2-2 draw against Sligo Rovers in an entertaining contest at Aileach on Saturday afternoon. Paddy McCourt's youngsters found themselves a goal down at half time and the Bit O' Red probably felt they had done enough to win the game when they doubled their lead heading into the last ten minutes. 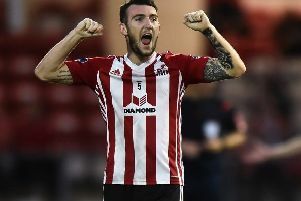 Brandon Crockett had other ideas however and he added to his goal last week against Cavan and Monaghan with a double here. In the end, City might feel they could even have nicked the win after Crockett and the influential Reece Monaghan had turned the game late on. A special mention too for Trent Doherty and Flynn Burns who made their respective debuts for the Brandywell side.